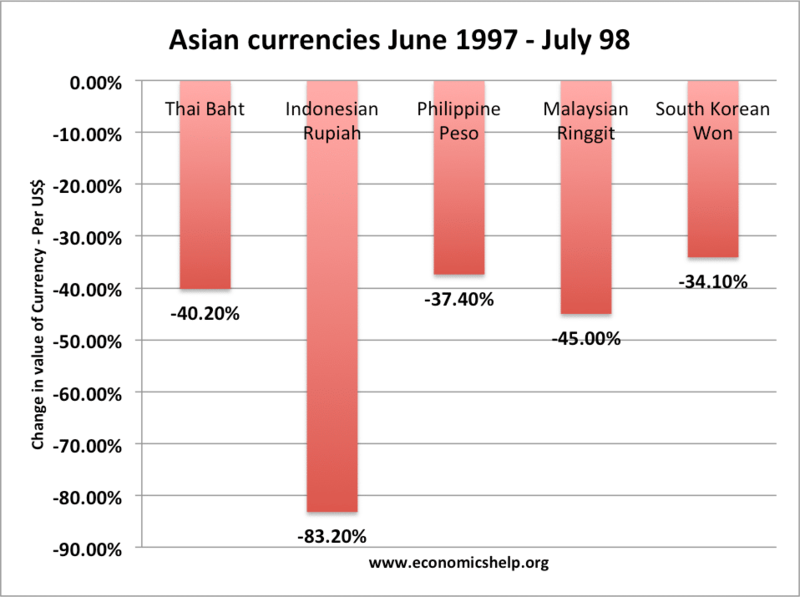 The Asian financial crisis of 1997 refers to a macroeconomic shock experienced by several Asian economies – including Thailand, Philippines, Malaysia, South Korea and Indonesia. Typically countries experienced rapid devaluation and capital outflows as investor confidence turned from over-exuberance to contagious pessimism as the structural imbalances in the economy became more apparent. The crisis of ’97-99 followed several years of rapid economic growth, capital inflows and build up of debt, which led to an unbalanced economy. In the years preceding the crisis, government borrowing rose, and firms overstretched themselves in a ‘dash for growth’ When market sentiment changed foreign investors sought to reduce their stake in these Asian economies causing destabilising capital outflows, which caused rapid devaluation and further loss of confidence. Due to the financial instability, the IMF was requested to intervene. The IMF implemented $40 billion of financial bailouts and also instigated economic reforms to tackle the economic imbalances. Unlike the debt crisis in Latin America, the debt crisis in East Asia stemmed from inappropriate borrowing by the private sector. Due to high rates of economic growth and a booming economy, private firms and corporations looked to finance speculative investment projects. However, firms overstretched themselves and a combination of factors caused a depreciation in the exchange rate as they struggled to meet the payments. Foreign debt-to-GDP ratios rose from 100% to 167% in the four large ASEAN economies in 1993-96. Foreign companies were attracting capital inflows from the developed world. Investors in the West were seeking better rates of return, and the “Asian economic miracle’ seemed to offer better rates of return than lower growth economies in the West. Current account deficits. Countries like Thailand, Indonesia, South Korea had large current account deficits; this meant they were importing more goods and services than they were exporting – it was a reflection of very high rates of economic growth and consumption. The current account deficits were financed by hot money flows (on capital account). Hot money flows were accumulated because of higher interest rates in the East. Fixed or semi-fixed exchange rates. This made currencies vulnerable to speculation. Also, interest rates were used to maintain the value of a currency. Causing relatively high-interest rates in S.E.Asia which caused hot money flows. Financial deregulation encouraged more loans and helped to create asset bubbles. But, the regulatory framework and structure of banking and firms meant loans were often made without sufficient scrutiny of profitability and rates of return. Over-exuberance. The booming economy and booming property markets encouraged expansive borrowing by firms. It also encouraged international investors to move capital to these fast-growing economies. There was an element of irrational exuberance – the idea that Asian economies were undergoing an economic miracle where high returns were guaranteed. Higher US interest rates. In the late 1990s, the US started to increase interest rates to reduce US inflationary pressures. Higher interest rates in the US made the East less attractive as a place to move hot money flows. As hot money flows into the East slowed down, Asian currencies started to fall and governments struggled to keep exchange rates at their fixed level against the US Dollar. Contagion. On 2 July 1998, due to speculative attacks, Thailand was forced to float their currency the Thai Bhat. This caused a rapid devaluation, which triggered a loss of confidence throughout the Asian economies. Soon, other countries were forced to devalue as investors wanted to get out of Asian currencies. Investors realised the previous optimism was starting to look misplaced. Debt default. In the run-up to the crisis, both government and private firms built up high external debt ratios. However, the devaluations caused debt repayments to become more expensive and as a result firms and countries started to default on their debt repayments. At this stage the IMF intervened to try and stabilise the crisis. However, their intervention has proved very controversial, with many arguing that their intervention made things worse. Higher interest rates in Indonesia and the Philippines did not stop the devaluation of the currency – suggesting investors were not convinced such high-interest rates were sustainable. The IMF insisted on fiscal restraint – lower spending, higher taxes and privatisation. This contractionary fiscal policy caused the economic downturn to exacerbate and the economy plunged into recession. Bankruptcies increased and there was a flight of capital. Economists such as Joseph Stiglitz and Sachs emphasised the importance of market sentiment in increasing the magnitude of the problem. The initial problem was containable but because confidence evaporated there was a flight of investors – like a classic bank run causing an unstoppable downward momentum. Severe Recession. Hit by the loss of confidence and rise in debt repayments, firms cut back on investment, leading to lower growth. The large devaluations also hit consumer spending as the price of imports and imported raw materials rose. This caused a recession in countries, such as South Korea, Indonesia, Malaysia and Thailand. 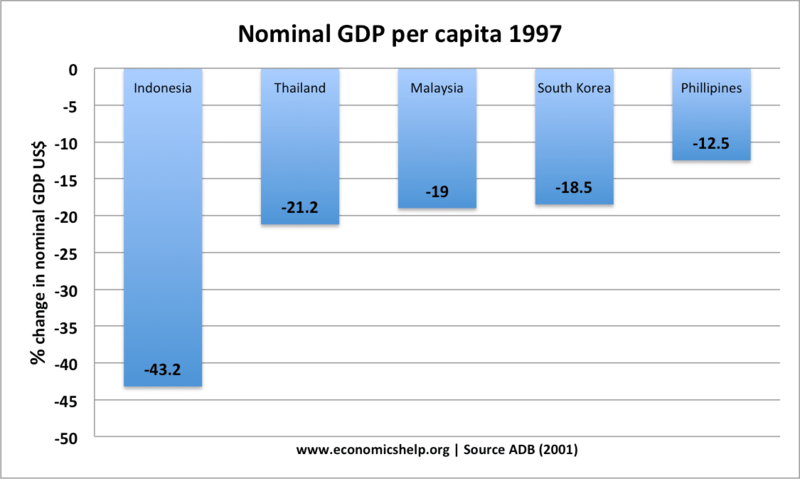 Measured in dollar terms, Indonesia experienced a catastrophic 84% fall in GNP between June 1997 and July 1998. Inflation – devaluation caused import prices to rise. Global effects. The Asian crisis hit investor confidence in the US, though lower interest rates helped to stabilise US economy. China was largely insulated from the crisis because China had attracted physical capital investment and did not rely on foreign flows of capital. The crisis had a negative effect on Japan’s economy and they struggled with a decade of low growth. To a large extent, the Asian economies have recovered from the crisis. In particular, South Korea, Malaysia and Hong Kong have enjoyed strong economic growth.